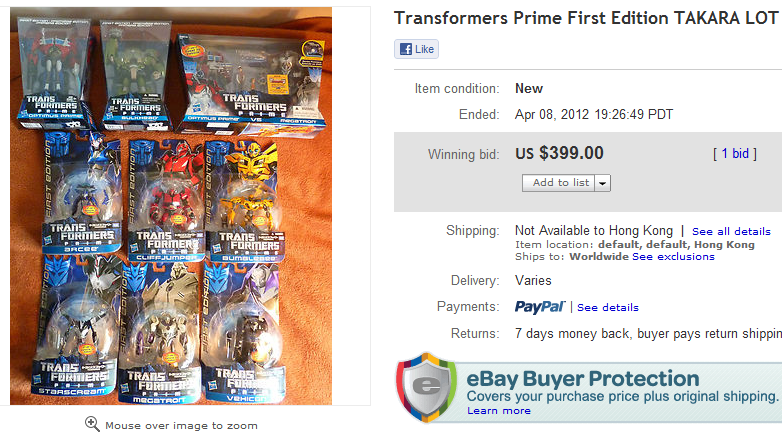 I've just sold my last lot of toys-for-sale on eBay and made around 100 USD off it, after all fees. I've been doing this--buying and selling Transformers and related toys--since January of this year, partly to exploit a money-making opportunity that presented itself and partly to perform some kind of informal experiment that would lead to academic research ideas. I've already made close to 50,000 pesos in profit doing this, but this lot is definitely the last; I've made my money, I've made my point, the experiment is over, so it's best to just quit while I'm ahead--at least for this kind of short-term play. Apart from buying toys to sell, I also buy toys for my personal collection. I'd like to think of myself as a more reasonable collector than most--my collection count is easily under 100 when a lot of others have theirs at 500 and up. 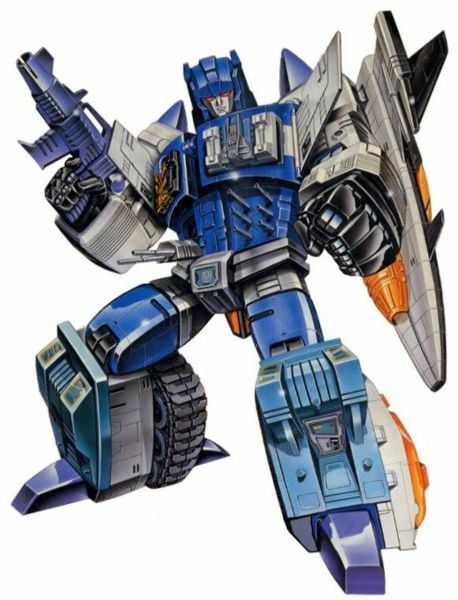 I have specific rules, like they have to be part of a particular series (Generation One Transformers, Yuusha/Brave, and Eldoran, for example) or fit a specific theme (the cast of the 1986 Transformers animated movie, for example, or some version of Optimus Prime); in general, I'm more into the old-school, 80s stuff and tend to avoid more modern figures. Also, rationality in collecting toys in Hong Kong is necessary given the fact that space is a very scarce and expensive resource here. Still, to a lot of outsiders--those who don't share or "get" the hobby, including a lot of my friends--I'm crazy as hell for spending "so much" on these toys. So sadly, part of the motivation for writing this post is to make them understand that what I'm doing is not as stupid as it seems, that if you are open-minded, resourceful, and patient enough you can actually make good money both in the short and long run from buying collectible toys, and that if you actually like toys, you get to feed your hobby at the same time. I will share some of my experiences in this post, including enough specifics so that those of you who are willing can actually replicate some of the things I've done and make a couple of thousand pesos yourselves. Unlike a lot of "durables" that people typically buy--cars and electronic gadgets, for example--some toys, like the ones I collect, retain their value after purchase, sometimes even after use, and increase in value almost always over time. So my toys are not just toys but are also assets in that they may be resold to a fairly big and active secondary market. And because there is a fair chance of an increase in value over time, they may also be considered investments. To illustrate, 21 years ago when it was introduced, Transformers Generation One Overlord cost around 50 USD; today, an unused Overlord that is in fairly good condition would easily sell for 1,000 USD, for a nominal annual return of 15%--compare that to an annual nominal return of 6.4% for the S&P 500 in the same period. If you had the toy brand new, played with it but kept the figure and the box in pretty good condition, you'll be able to sell it today for at least 600 USD, for a still-remarkable 13% annual return. But you don't have to go back in time to the 80s or 90s to make a killing on a toy investment. There are good deals to be had in the secondary market that can provide attractive returns in the medium to long term--you just have to know where to look. I guess I'm pretty lucky to be in Hong Kong because this is one of the better places to find such deals. Apart from the numerous toy stores in Mong Kok and Yau Ma Tei (In's Point and Richmond Shopping Center, to be more specific), you can also find very good deals online through Yahoo! Auctions Hong Kong. In general, goods are cheaper when bought via Yahoo! Auctions that from brick-and-mortar toy stores; while you have to physically be in Hong Kong before you can register and buy stuff, understanding Chinese is not a requirement since Google Translate is almost always good enough. Unlike in eBay where transactions are completed remotely, in Yahoo! Auctions Hong Kong buyers and sellers have to meet in person, usually at one of the MTR stations, to consummate an exchange. I've done this at least 25 times, and it has almost always been a pleasant experience (I remember telling my girlfriend how the idea of being a part of Hong Kong's underground economy has always excited me, and she thought I was being weird). For rare, Japanese-exclusive toys, your only recourse is Yahoo! Auctions Japan, for which you would need the services of an agent like Shopping Mall Japan (I've tried Celga, but SMJ is cheaper and better). Despite the agent's markup and shipping costs, if you play your cards right you can still end up paying significantly less than what the same item sells for in eBay. Speaking of eBay, remember that to make money, you buy items from places like Hong Kong and Japan, where they are cheaper, and sell them to the rest of the world through eBay. So having an eBay and Paypal account is very important in taking advantage of toy-related investment opportunities. In Part 2 on Thursday (I promise), I'll talk about one such opportunity. And I'll tell you exactly how you can make at least 100% of your investment in a span of a month by buying and selling a particular kind of toy (it's not unlimited, though, the supply dwindles even as I type; but the demand is definitely still there).